VII.2.48 Pompeii. House of D. Caprasius Primus, wine seller? Linked to VII.2.49. Excavated 1861, 1865 and 1868. VII.2.48 Pompeii. December 2005. Entrance. 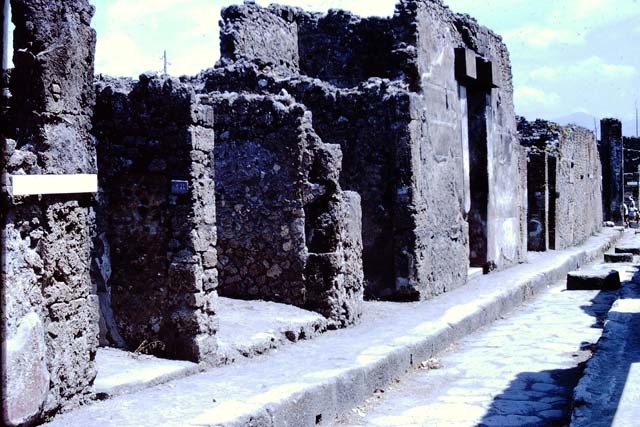 Via degli Augustali, north side, Pompeii. 1966. 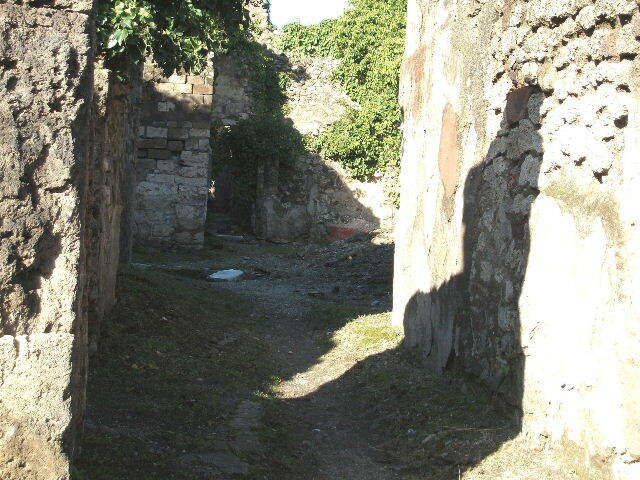 Looking towards doorways at VII.2.48 (on left), VII.2.49, VII.2.50, VII.2.51, and VII.2.52/53. 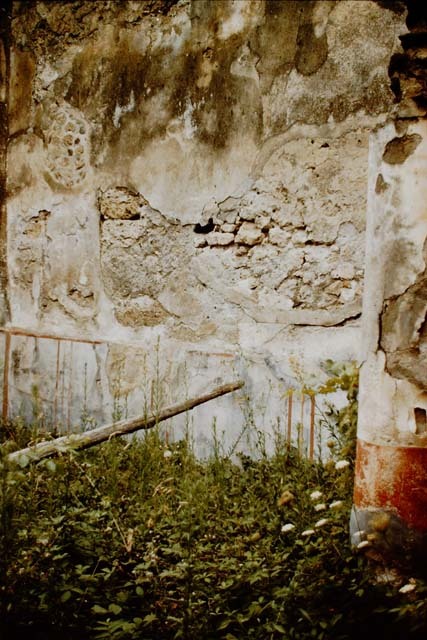 VII.2.48 Pompeii. December 2004. Looking north along entrance corridor across atrium to corridor at rear. Looking towards the east wall of the garden area, with window and doorway opening into a corridor at the rear of the house. 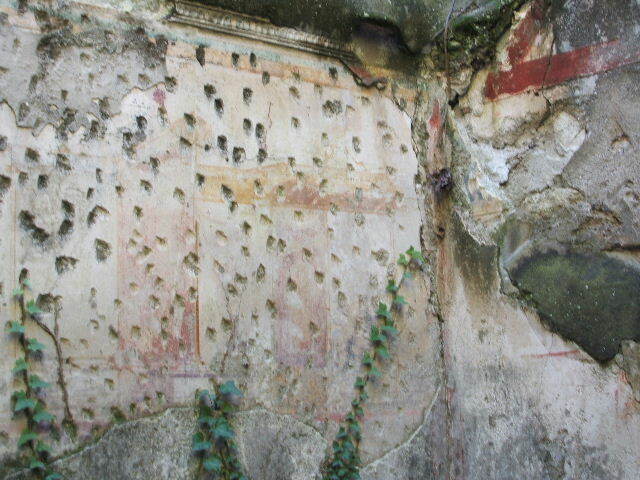 The walls were covered with simple rough plaster, and a column of the portico has been incorporated into the wall. 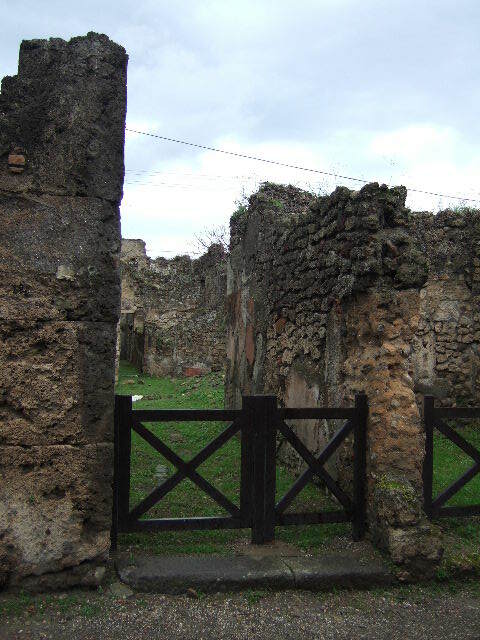 VII.2.48 Pompeii. 1959. North wall of garden area. Photo by Stanley A. Jashemski. 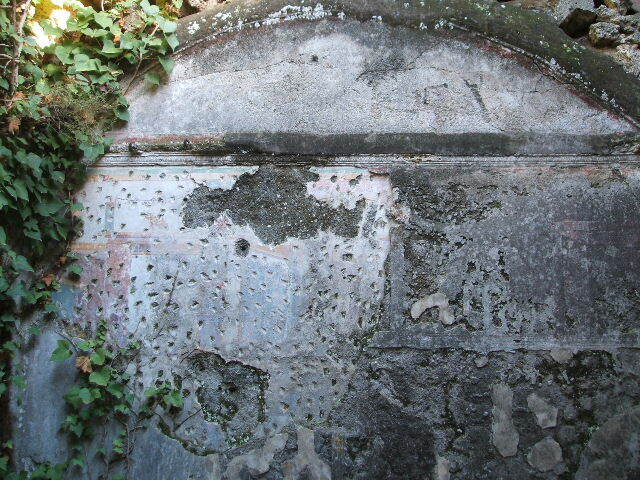 According to PPM, the area had a simple decoration with a low black zoccolo (dado or plinth) with splashes of yellow and panels with painted plants. The middle zones of the walls were also black and contained panels separated by narrow compartments crossed by golden candelabra. Above these, the walls were covered with a rough plaster, visible under which were the remains of a more ancient decoration. Looking towards the north-west corner of the garden area, and row of dolia embedded in the soil near the west wall. Cubiculum (bedroom) at rear, looking towards the south-west corner, and doorway to corridor in the west wall. 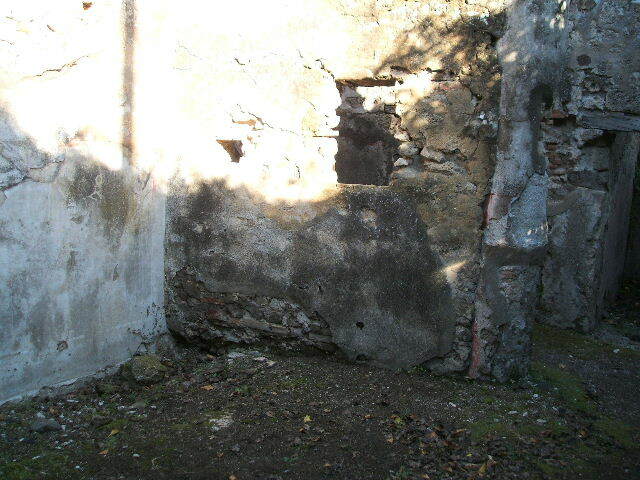 VII.2.48 Pompeii. December 2004. 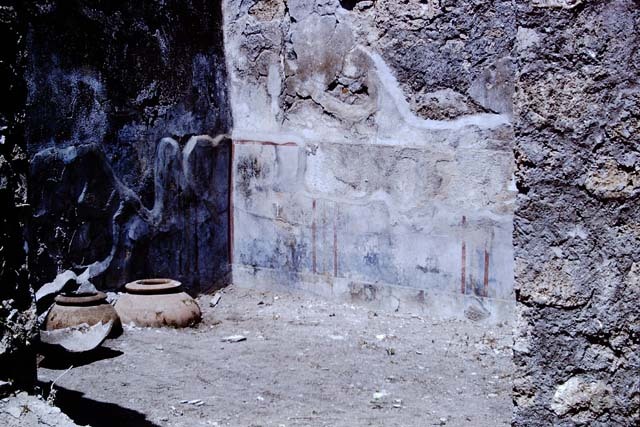 South-west corner of cubiculum, with remains of painted decoration. VII.2.48 Pompeii. December 2004. 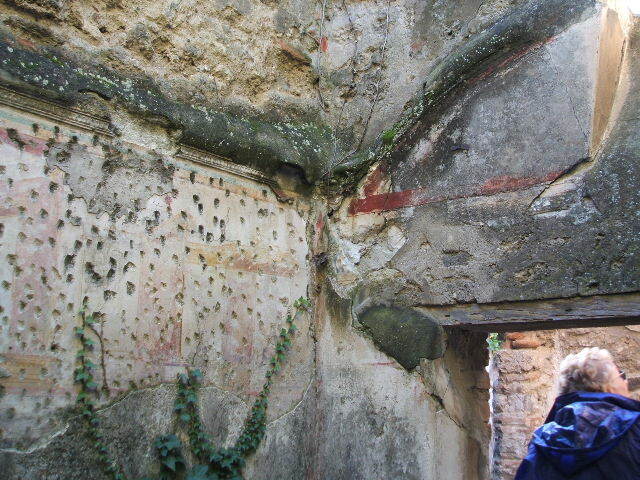 East wall of cubiculum, with vaulted ceiling, and remains of painted decoration.